In 2002, Irshad, was 10 years old living in the slum with his parents and siblings in a tiny dwelling. Irshad was a child-laborer who worked 9 hours a day making locks for metal trunks. His daily wage was 10 rupees (roughly 20 cents). Each week he would collect his money, give 55 rupees to his father, and keep 5 rupees for himself. After one such week, he decided to use those 5 rupees to rent a bicycle for a few hours. He had never ridden a bicycle before, but having spent so many hours watching other children, he was sure he would get the hang of it quickly. For a while he rode around the slum with enormous joy and pride and sense of accomplishment. But his joy was short-lived. While riding past a woman frying Indian sweets, he lost control of the bicycle and fell on the frying pan of burning oil. Irshad was rushed to the government hospital where he was diagnosed with 60 percent burns, which began at the base of his neck and ended half way down his right thigh. He was injected with numerous painkillers, but after 3 days in the hospital little had been done to heal the burns. His cries of anguish were incessant, while, day-by-day, Irshad grew weaker. His older sister then came from the village and decided that her brother should die at home in peace surrounded by his family, rather than in this hospital with people in every bed, every inch of floor space used, blood stained sheets, doctors who had become numb to the pain which surrounded them, and dead bodies which lay covered until staff from the morgue made their evening rounds. Noah was having lunch with his dear friend and teacher, Lucy-didi when a message came to her house with the news that Irshad was dying in his home. Lucy-didi and Noah rushed to the house where they found Irshad lying naked on the cold dirt floor of his family’s dwelling with his head resting on his father’s lap. The burns were inflamed and infected; he was in excruciating pain. Within minutes they had put together a makeshift stretcher and together with his father, carried this dying child through the slum to a private clinic operated by a friend. It took hours for the nurses to clean and dress his burns and infections. While this was taking place, Lucy-didi and Noah each held onto Irshad’s hands and Lucy-didi sang songs to him throughout the day and evening. Each day Lucy-didi and Noah went to visit Irshad, and day by day their young friend became stronger and stronger. After three months of hospitalization, Irshad was strong enough to leave the hospital. His scars were deep, both physically and emotionally, but his youthful strength had returned, an inspiration to all of us. Shortly thereafter, Noah was called to Irshad’s house and told that Irshad had a gift for him. Noah arrived at his house and found that Irshad had borrowed a tape player and was putting on his favorite Hindi film-song. The boy then began dancing passionately, and continued for 10 minutes, perspiration dripping from his forehead and his chest, but delirious with joy. Noah felt like the dance was just for him; he speaks of it as the most beautiful thing he has ever seen. Irshad later had minor surgery which allowed him to walk with greater ease and he visits regularly with his Calcutta Kids friends. His hope is to be a doctor like the doctors who saved his life. Noah and Irshad remain very close. 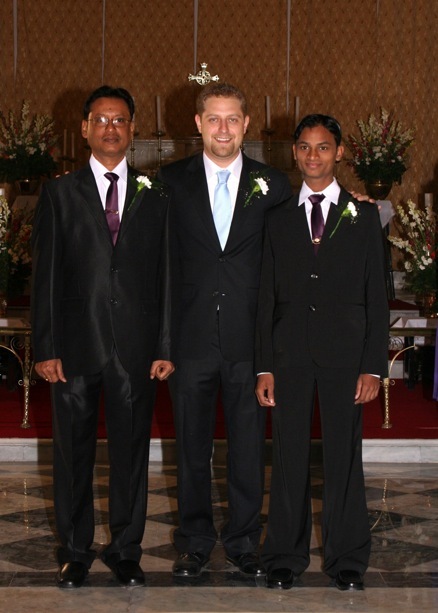 When Noah was married in January 2012, Irshad was one of his groomsmen. November 14 was Children’s Day. To celebrate, the entire Calcutta Kids team came together with the community to have a parade through Fakir Bagan. It started with a nine-person band, which gathered mothers and children from around the community. Health workers had prepared balloons, noise makers, and health-promotion signs for the children. Starting from the edge of the community, a large group of women and children followed the band and shared in the message of a healthier community. The parade was followed by one of our health workers on a bicycle rickshaw, providing health information to the community through a loud speaker. The name “Calcutta Kids” was heard throughout the community, and many women and children joined in the parade as it looped through the narrow lanes of Fakir Bagan. After over an hour of energizing the community, health workers provided snacks and the great Children’s Day event was brought to a close. Bringing the community together to celebrate and inform on healthy choices made this year’s Children’s Day great for Fakir Bagan. In early November, a friend of Calcutta Kids, Rebecca Miller, visited Fakir Bagan. 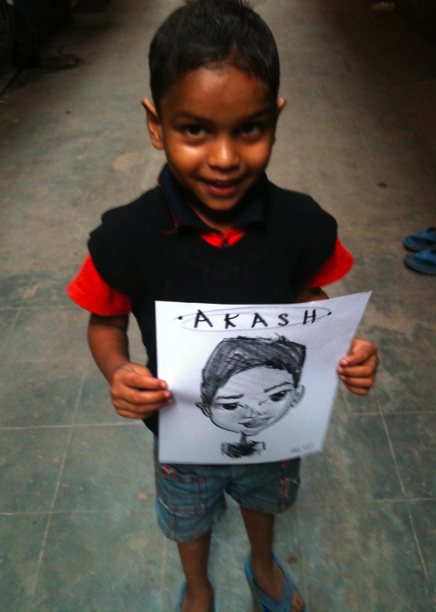 She is a talented artist, and brought joy to the community by doing caricatures of mothers and children attending our monthly Growth Monitoring and Promotion (GMP). The community became very excited by her presence, and one man even drew a picture of her drawing pictures of others. The mothers, although somewhat shy, took their drawings to the community health workers and displayed them with smiling excitement. It is always nice when friends of Calcutta Kids come to share their talents with the community. Calcutta Kids is committed to the proposition that every experience of an organization like ours, positive or negative, needs to be shared with the larger development community. Accordingly, we are most pleased that CIRM, a research group in Chennai, is carrying out an in-­‐depth study of our program and the challenges that made it inadvisable for us to continue its operation. The publication and dissemination of this work will certainly enable other groups to learn from our experience, and, in turn, move forward this important area of international public health. Flip-Charts, Training and a Community Center – Oh MY(CHI)! The Maternal and Young Child Health Initiative (MYCHI) staff has been working diligently over the past nine months to make our programs even more effective. Danya and Sumana have been revising the pregnancy care program to reflect changes in international maternal and neonatal health guidelines and to utilize the lessons we have learned over the past 6 years. We now have two excellent flip charts that are culturally appropriate to help counsel families about best practices and the early detection of problems. In May, we had an in-depth training on the new pregnancy care program with all of our community health workers and other MYCHI staff. In this training, we were able to explain exactly why each type of data is collected; to provide refresher information on the complications that can occur during pregnancy, delivery and the first few months of life; and to talk through specific problems that have arisen in our area. In the course of the training, we also were able to strengthen the bonds that have enabled us to work as a team and to have fun together! We are also working to revise the child health program to better tackle the non-food related causes of malnutrition as well as to update the program more generally. During the past six months, we worked with a small sample of severely malnourished children to find out with precision the causes of their malnutrition. We found that many of these children were suffering from anemia, a high worm load, several micronutrient deficiencies and stress in the home, all of which hinder the absorption of nutrients and, in turn, impede affect mental and physical development. We now can use this information to inform our protocols as we redesign the child health program. We are very excited about the new community center, located in Fakir Bagan itself, which will be opening in December – a safe, clean and attractive site where we can hold our regular community meetings and gatherings of small support groups – a space for women and children to come together comfortably for support and information.